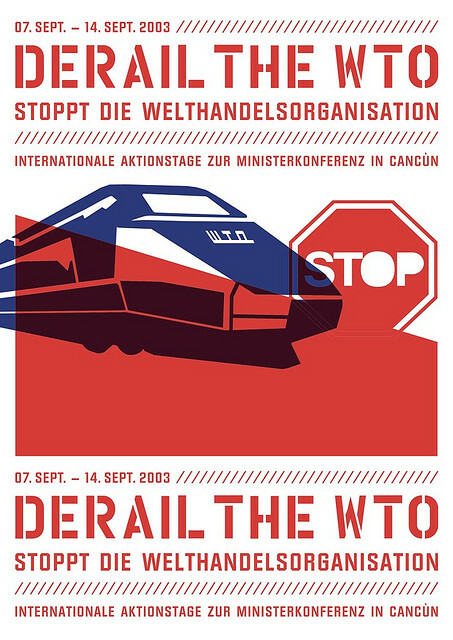 It was ten years ago today that talks at the Ministerial Conference of the World Trade Organization (WTO), held in Cancún, Mexico ended in deadlock. Member states could not agree a consensus mainly due to a lack of movement by the developed world on agricultural subsidies and their insistence on the inclusion of new trade issues. At the time, many development campaigners and a number of negotiators from the developing world celebrated the fact that the world’s leading trade powers had failed in their attempt to push for agreement on the so-called ‘Singapore Issues’. Did this represent the increased activism of developing states in global trade? What has happened during the decade since Cancún? “the key division at Cancún was between the can-do and the won’t-do. For over two years, the US has pushed to open markets globally, in our hemisphere, and with sub-regions or individual countries. As WTO members ponder the future, the US will not wait: we will move towards free trade with can-do countries”. With hindsight it appears that such comments were not simply diplomatic rhetoric. What we have witnessed since 2003 is a shift in the approach of the established trade powers. They have moved towards a focus on bilateral and regional trade agreements with developing countries and emerging markets, in particular, rather than multilateral negotiations within the WTO. The European Union (EU), in particular, has embarked on numerous bilateral trade negotiations in recent years. As of August this year the European Commission reported that it has 29 trade agreements in place and is currently negotiating with Japan, the US, Canada, Malaysia, Vietnam, Thailand, Morocco, India, Mercosur (regional grouping in Latin America), Moldova, Armenia, Georgia, Ukraine, Costa Rica, El Salvador, Guatemala – to name but a few! Particularly contentious for many development NGOs has been the negotiation of Economic Partnership Agreements (EPAs) with African, Caribbean and Pacific (ACP) states, which has allowed the EU to include at the bilateral level many of the issues that developing countries had resisted at Cancún. The power asymmetry between the EU and the ACP sub-regions involved in the EPA negotiations has enabled them to determine the key aspects of the negotiating agenda. The EU has pursued a ‘deep integration’ approach to its trade negotiations aiming to secure FTAs that go beyond simply the liberalisation of trade in goods. This has meant the re-introduction of the ‘Singapore Issues’ onto the negotiating table. They refer to the inclusion of investment, competition policy, government procurement and trade facilitation measures. Their introduction (except trade facilitation) would mean that European firms would have to be treated in the same way as any domestic provider. This would pose significant limits to the range of development strategies available given that regulatory policy, previously the preserve of national politics, would become part of the FTA. In particular it would prevent the adoption of an active industrial policy. The introduction of these behind-the-border issues would also create a harmonisation of the business environment in line with the liberal model adopted in Europe, which would be of benefit to European business sectors looking to invest in partner countries. In essence, what the last decade has revealed is that the focal point of the trade liberalisation agenda has shifted away from the WTO to bilateral trade negotiations. For those of us who seek to resist the neoliberal free trade agenda we must be careful what we wish for! * A much more detailed (and considered!) elaboration of some of the arguments presented here can be found in Stephen R. Hurt (2013) ‘African agency in world trade undermined? The case of bilateral relations with the European Union’ in William Brown and Sophie Harman (eds), African Agency in International Politics, Abingdon: Routledge, pp. 49-64.